The DYNAMICA Series is a multipurpose continuous motion carton machine with an increasing sales success. Its strength is absolutely the competitive price which, together with its robustness and simplicity of use, allows it to be sold worldwide to the multinationals and to the local companies. Compared with the previous models it offers an improved ergonomics, a new HMI, no limits in terms of product feeding, and a new product bucket belt which allows a better integration with the product feeder and a considerable reduction of dimensions. 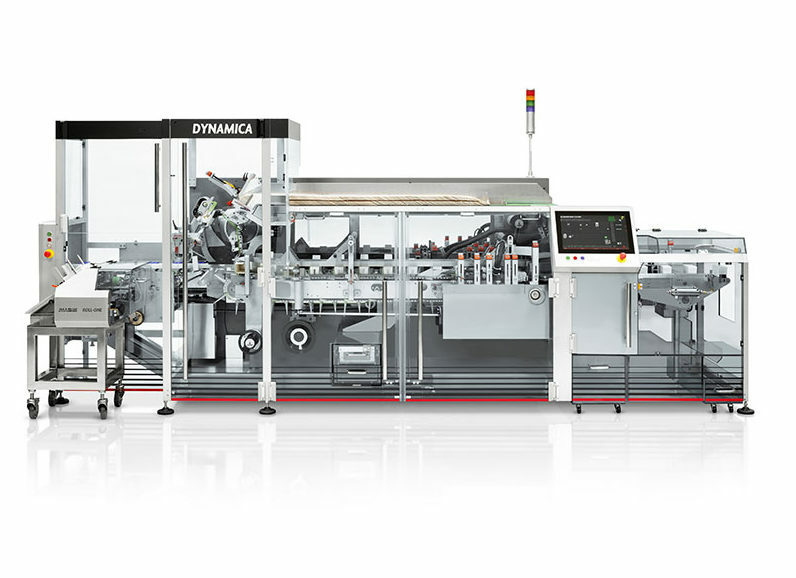 The NEW DYNAMICA can be equipped with the unique IMA leaflet folding unit ROLL-ONE, the integrated carton serialisation unit and a gluing system HHS characterized by the simultaneous use of hot glue and cold glue and a relevant glue presence control. The new DYNAMICA has been exposed at interpack 2017 in line with the NEW stretch banding wrapping machine MS260 and the NEW side loading case packing machine CPH2, equipped with the Track&Trace Solution.